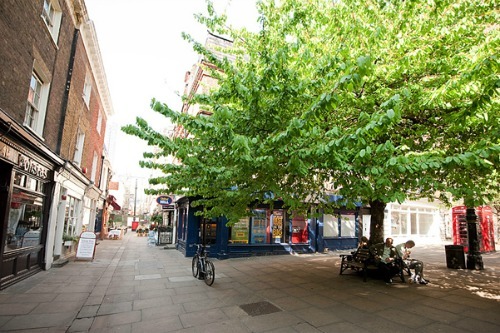 Take a stroll through Shepherd Market – a wonderful area for shopping & dining in Mayfair! Say “Mayfair” to most Brits and they’ll immediately imagine that last navy blue square on the Monopoly board. The most desirable place to be. The game may be 80 years old, but Mayfair certainly isn’t, deservedly retaining its place as one of the most desirable locations in London. Home to plenty of little English boutiques, fine restaurants and sophisticated bars as well beautiful green places to stroll such as Green Park, or art to admire at the Royal Academy of Arts, as well as, of course, close proximity to royalty courtesy of Buckingham Palace. 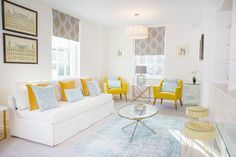 And from Mayfair’s position right in the centre of London it offers the perfect spot for whizzing along on the tube to any remaining sights on your list. Mayfair takes its name from a two week fair held every May in the 17th and 18th centuries. Originally intended just for cattle trading, the fair grew bigger and more riotous over the years. Until one day Queen Anne decided enough was enough and stopped the fair entirely, commissioning local architect and designer Edward Shepherd to redesign the area to appeal to a more sophisticated crowd. And so, the site of the old fair became Shepherd Market, complete with a duck pond, paved alleys and a two-storey market theatre, and as hoped a new artistic, theatre-going mass moved in. 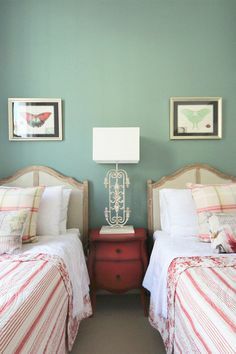 By the 1920s Shepherd Market was the place to be seen, and Michael Arlen, who wrote “The Green Hat” that was later turned into a film starring Greta Garbo, was just one of a number of artistic types who rented rooms in the Market. P.G. Wodehouse also had his characters Bertie Wooster and his faultless manservant Jeeves residing on Half Moon Street at Shepherd Market. Today, it retains its up-market reputation, with the Duke and Duchess of Cambridge no less (aka Wills and Kate), and Kate’s almost as famous sister Pippa, known to sample the restaurants and clubs until the wee small hours. 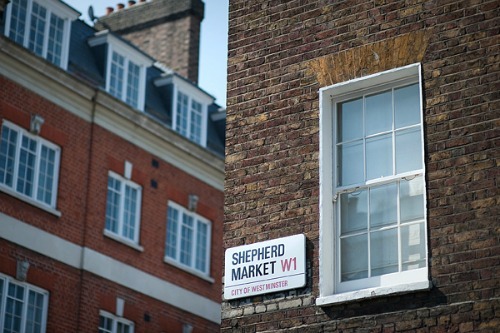 Well … pocketed between the bustling Curzon Street and Piccadilly, Shepherd Market offers a retreat. Underfoot the streets are paved, with narrow roads leading into a central square which is lined with chocolate box restaurants offering breakfast, lunch and dinner from across the globe and traditional British pubs serving up English ale with fish and chip suppers. There are also trendy coffee houses and traditional English clothes shops, as well as those quintessentially British sightings; a proud red pillar box and two bright telephone boxes – which you can then tick off your must see list! And where should we go? 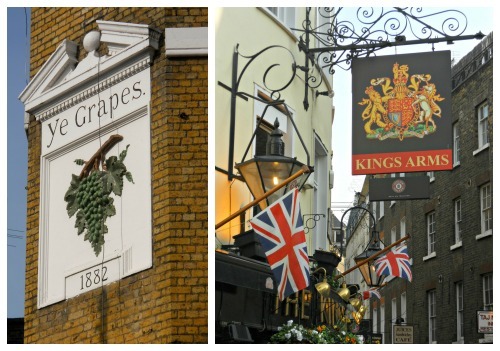 For a pint of English ale there is Ye Grapes and the Market Tavern. Whilst, for dinner, Shepherd Market, like London itself, shows it really does draw from the world, with Indian, French and Italian restaurants competing with Lebanese, Iranian and Thai for your custom. Time for a swift half at Ye Grapes? We recommend the delightful Italian Da Corradi, down a narrow walkway but always filled with diners, it serves beautiful Italian food as well as full English breakfasts for the locals and visitors alike. It also has a wall of celebrity customers, where you can see stars such as Paul McCartney standing somewhat awkwardly with the manager himself. Elsewhere, if you’re feeling brave, the Market offers perhaps the most unusual fusion cuisine ever heard of at the L’Autre Polish-Mexican Bistro. 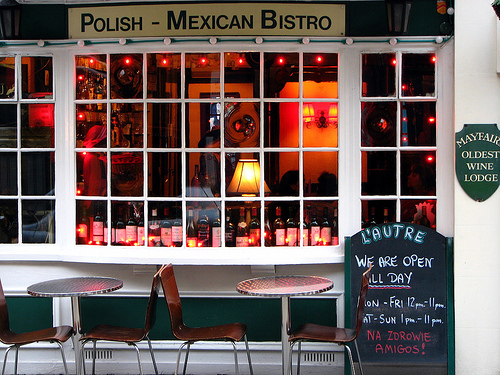 Originally a Polish restaurant, which broadened its menu quite considerably due to its proximity to the Mexican Embassy, where else could you expect to sample sizzling enchiladas and wild game sausages all washed down with Polish vodka and Mexican beers? 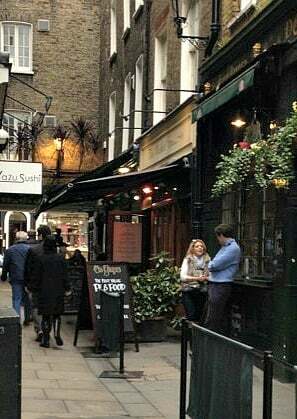 A little of everything – even in the same restaurant – in Shepherd Market! Need a little pick me up? Well, Mayfair is also home to plenty of businesses, and those types that like to work long long hours, so perhaps a little coffee is needed. Caffe In is a little gem, with plenty of spaces to tuck yourself away for an hour or more with a cappuccino and a slice of chocolate cake, or perhaps to grab to an espresso and head back to work if you’re one of those local hedge funders. And if you’re after some little (or large) gifts for the folks back home, there are also some great little boutiques. 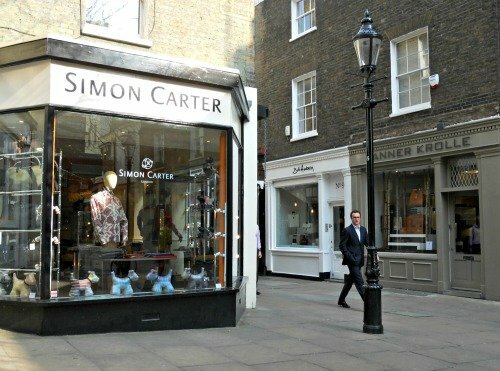 Folk Clothing for your casual London look, Simon Carter for beautiful striped socks, quirky cufflinks and leather wallets, and beautiful leather bags at Tanner Krole and Bill Amberg. A new bag for each day of the week surely? Art lovers will also enjoy taking a peek in some of the super trendy art galleries that are dotted throughout Shepherd Market along with the boutiques, gorgeous jewellery shops and dining spots. You can find all the shops and galleries on the Shepherd Market website so you won’t miss any during your visit! 1. Green Park. The Park offers you over 40 acres of trees and grassland to stroll through on your way to Buckingham Palace. 2. The Royal Academy of Arts. The Summer Exhibition, the world’s largest open submission exhibition and the thing to go to if you’re an art aficionado, is held here every year from June to August. However, The Academy offers sculpture, paintings and architecture to admire all year round. 3. Tea the Ritz. Well, when in London, what else can you do but dine on dainty Cucumber Sandwiches with Cream Cheese, Dill, and Chives on Caraway Seed Bread accompanied by perfect English tea, plenty of tea pastries and cake and possibly a glass of Champagne, if that wasn’t indulgence enough. 4. Shopping at Mount Street. Luxurious living here we come! This street has it all with beautiful fashion, china and glass, as well as art and antique galleries all housed in beautiful English red brick shops. 5. Dinner at Galvins at Windows Restaurant and Bar. With unparalleled views over London and with Michelin starred modern French cuisine, this may be the most relaxing way to sightsee. Posted on Wednesday, October 23rd, 2013 at 3:23 pm in Shopping. You can follow any responses to this entry through the RSS 2.0 feed. You can leave a response, or trackback from your own site. What a nice story. We always went out the back door of our hotel and walked up Downes St. to the Hilton for SunDay Brunch on the top floor bar. There used to be a quite good Indian restaurant in the market as well as a sort of coffee shop. There was Trumpers near by for a gentleman’s haircut. The market had odd shops and one touristy place in the basement that did a sort of 15th century ale and jousting show. Food was terrible but event was fun. But alas,my favorite hotel needs a “Perfect” re-do. And it was in the same hotel elevator that a lady asked Noel Coward what he was going to do next (the 30s). He replied “‘Madame, I am going to become a Kangaroo”.